In this upper-intermediate level English course, you will become familiar with instructional or 'how to' English grammar. You will also study different phrases for giving instructions and learn about the types of English articles. By the end of the course you will have greatly enhanced your English reading and listening skills and be much more ready for your next English conversation. That's a great reward for just a few hours work! This course will first introduce you to Instructional Phrases. You will learn that they start with a verb and contain no subject (as in, the person who does the action is not mentioned). The course will then teach you useful phrases that you can use for giving instructions. You will study indefinite and definite articles including the rules of their proper usage. You will also learn when to use articles with adjectives and time. Next, you will study the English articles of place and learn the rules of when to use them. The course will also teach you how to use English adverbs with certain adjectives as well as auxiliary verbs for adding emphasis. You will then delve into phonetic sounds, studying the phonetic translations of different sounds and their basis. You will also examine a list of the markings we use on English written text to present it in different ways. 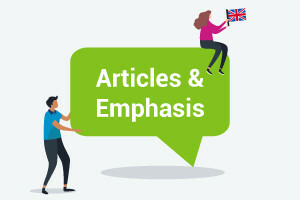 Articles can be confusing for some English learners but once you have gained an in-depth understanding of the rules and exceptions, everything will become much easier. This upper-intermediate level English grammar course is designed to make learning about the different ways to use articles and emphasis simple and enjoyable. So why wait? Check out the course now and gain a new English language skill in no time! List useful phrases for giving instructions. Define the use of definite and indefinite articles. Justify why certain phrases use articles and others do not. Show when we use articles for times and places and when we do not. Explain how we use cleft sentences to give emphasis. Illustrate how we use adverbs and auxiliary verbs as intensifiers when making emphasis. Identify the phonetic translations of words in phrases for giving advice. Provide examples of using markings and abbreviations in written texts.